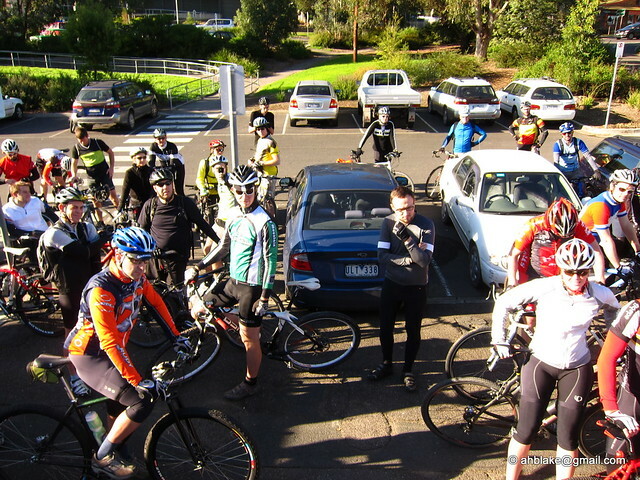 It was a beautiful sunny morning when everyone rocked up to Hurstbridge train station in preparation for the ride. Reuben was making last minute tweaks to brake toe-in on his brand new bike and Chris tried everything to get Blakey's loaner rear wheel to work on his singlespeed but there just wasn't enough chain. We ran out of laminated cue sheets pretty quickly and starting handing out ziploc bags with them instead - there was rain forecast for later in the day. 10am was upon us in no time so we said a few words of introduction, description and warning and then the ride rolled out. 58 riders this time - the turnout has been nothing if not consistent. There were plenty of new faces and also some repeat offenders, including the ever-consistent Sam McGregor who's finished more or less with the lead group on all of the MGG rides so far. Sam was the only one to complete the big triple over the weekend as well. He raced the Dirty Deeds CX Prologue on Friday night, the Hell Of The West road race on Saturday and then MGG #3 on Sunday. 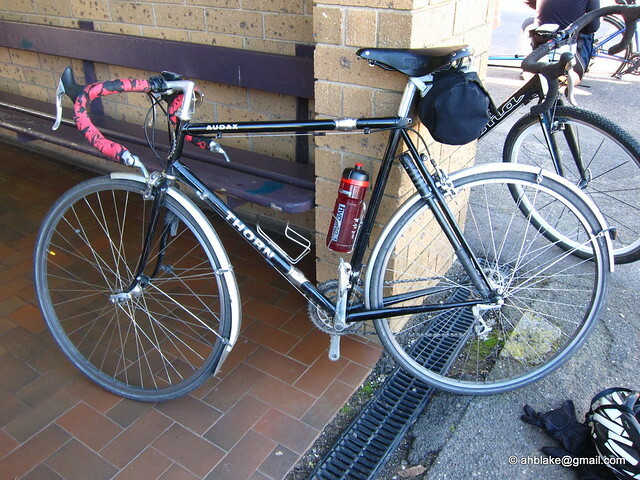 He also rode out to the start at Hurstbridge AND rode home again afterwards. Awesome. The weather stayed sunny all day so riders were treated to some awesome views - big blue skies over the Yarra Valley - fantastic. The wind was kicking pretty hard but most didn't seem to have a problem with it. There weren't too many exposed sections due to the, er, undulating nature of the terrain. Yes, it was hilly. We'd mapped out the ride on bikely and it reported ~1500m of climbing which we thought was solid but not too tough. Turns out people's garmins were reporting more like 2000m of climbing over the 80km course. Ouch! If we'd known there was that much elevation we might have made a few changes. Or maybe not... it was a ripper of a course, it's just that there was hardly a single part of it that was flat. After analysing the data from the officical MGG garmin - carried around the course by Tristram this time - it became apparent that bikely/mapmyride etc. all use the same database that maps GPS locations to elevation data. I remember reading somewhere that this database has about a 90m resolution so that means one elevation point every 90m or so. If there's lots of up and down within a short distance then that 90m grid of elevation points won't give you a very accurate elevation reading. So, lesson learned - trust the garmin (barometric altimeters give a nice continuous reading) and take anything bikely/mapmyride tells you with a pinch of salt. I think we'll take the official MGG garmin out on all our recon rides from now on. The checkpoints at St Andrews, Smiths Gully and Kangaroo Ground did a lot of business as hungry riders descended upon them en masse. Smiths Gully in particular was swamped by a lunch-hungry peloton. Allegedly they had only one microwave running non-stop to try and keep up with the pie and pizza orders and someone was seen running next door to call out for reinforcements to help get everyone's lunch moving quickly. 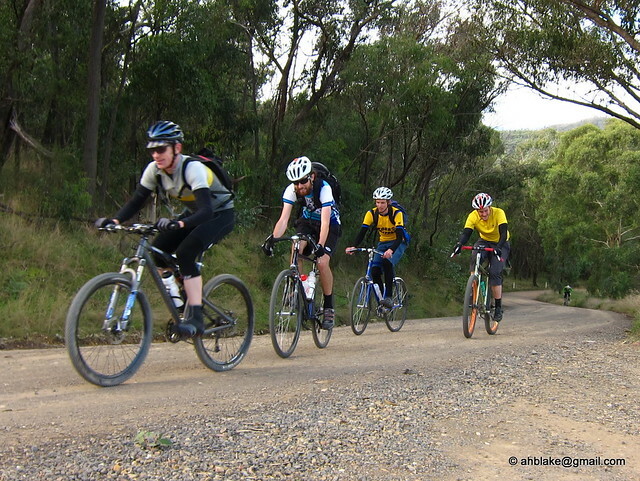 A number of riders pulled out at Smiths Gully and rolled straight back down to Hurstbridge. Probably for the best. If they were feeling iffy at that point in the ride then they wouldn't have liked what was coming in the second half - more hills. There were a few mechanicals reported - a blown-out sidewall, an emergency pie-plate removal, a number of flats - but no-one hit the dirt, despite the steep loose terrain. We'd marked some of the sketchier descents with warnings and I guess everyone heeded them. Good stuff! There was some talk about the difference between climbing all day on dirt as opposed to paved roads. 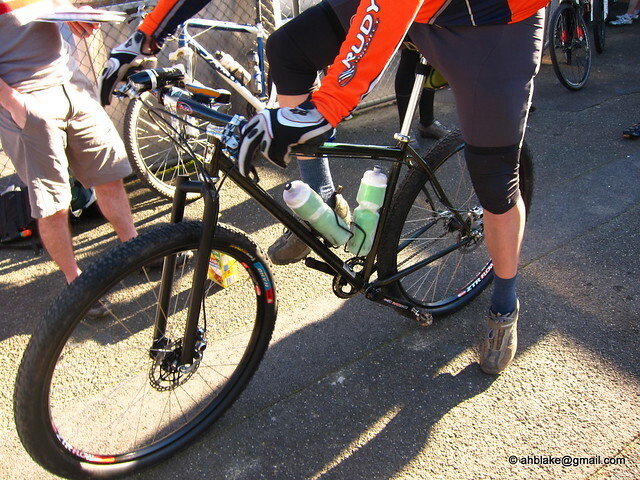 Some said the course felt more like a MTB ride than a road ride - not rough and technical, but very taxing on the body. 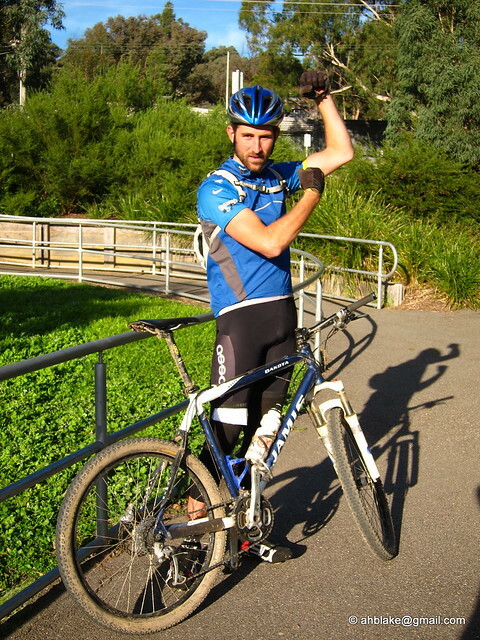 In fact there was one part that could only be ridden on a MTB - Black Cameron Road kicked up to a garmin-reported 29%. When we reconned the course, my calves were hurting just walking up the bloody thing, we didn't think anyone would actually ride up it! Speaking of recon, apologies to the handful of riders that missed the turnoff from Eltham-Yarra Glen Road onto Skyline Road. I could have sworn it was signposted! It sounds like most people rode past it a little and then looked at the kilometre marker on the cue sheet and realised "That must be it!" 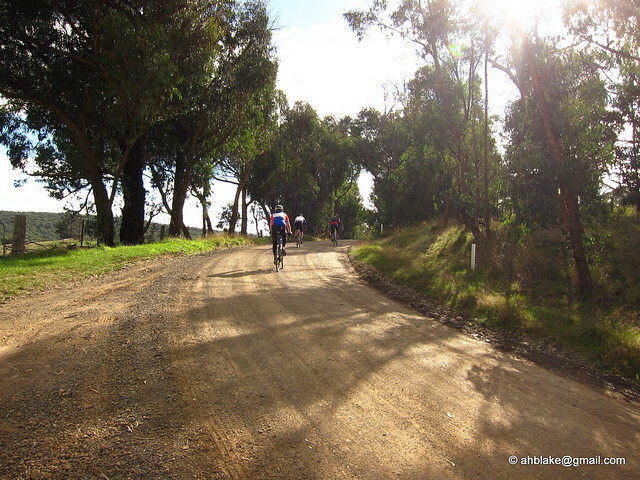 Some didn't and they got to enjoy the short sharp - and very scenic - descent down to Yarra Glen. And then they got to enjoy the same thing in reverse as they climbed slowly back up to Skyline Road to get back on course. Bonus miles! As usual there was a very broad selection of bikes. Road, MTB, CX, tourer, singlespeed. Ashley came in first on his roadie and didn't seem to notice that he'd been riding on dirt roads all day. Anthony and Tim on the other hand got bored of the dirt roads and took their singlespeed 29ers off-road to hit up some of the singletrack that criss-crosses the whole Smiths Gully area. 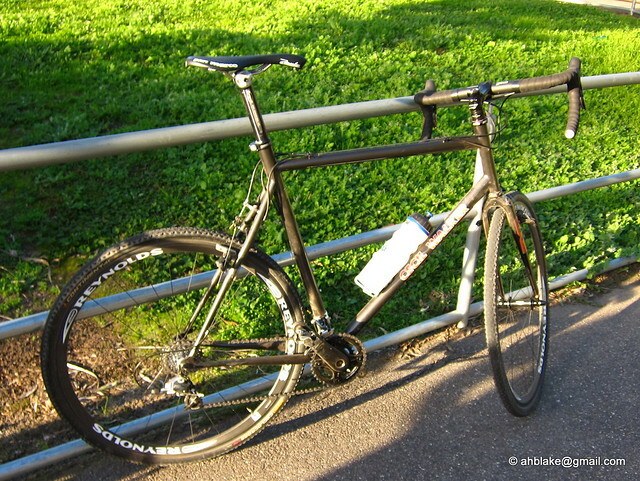 And by the end of the day Reuben had successfully shaken down his brand new Paconi-built custom CX machine - two flats, much brake pad tweakage and a minor off? It's not brand new any more! Piers and Tom rode fixed for MGG #2 but both turned up on Sunday riding singlespeed - wise choice I'd say - the loose descents would have been sketchy riding fixed - but they still had to honk up all those hills without the luxury of a downshift. Chapeau to all the singlespeeders! 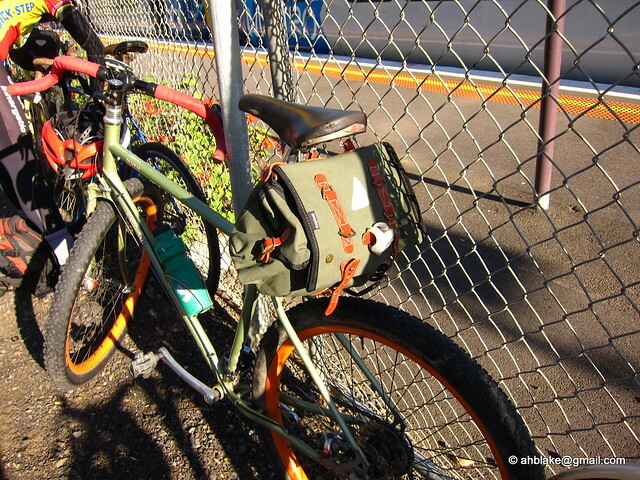 It was getting chilly at Hurstbridge station as we waited for the last riders to roll in. Thanks to everyone who sent us a text message or called in to say they were bailing out or heading home early. In the end, everyone was accounted for and, by all reports, everyone had a good time whether they finished the course or not. Hilly! We got a little lost and about 6 of us climbed Long Gully Rd a second time before getting a fix. The hardest hill of the day - long AND steep. D'oh. 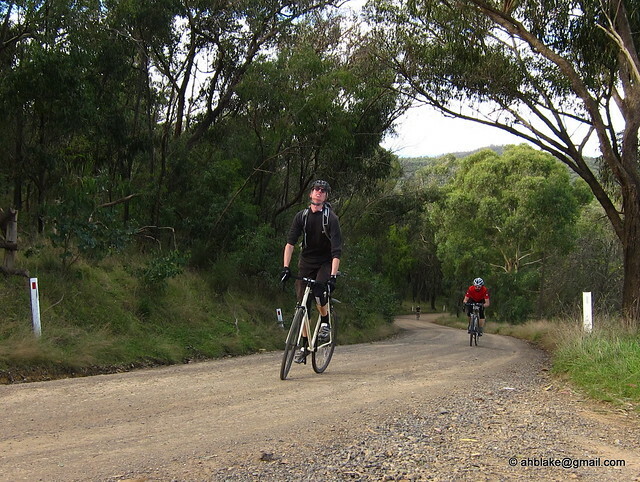 Despite a small bail out (Kangaroo Ground - Wattle Glen - Hurstbridge) we still did 81 kms. Does that count? 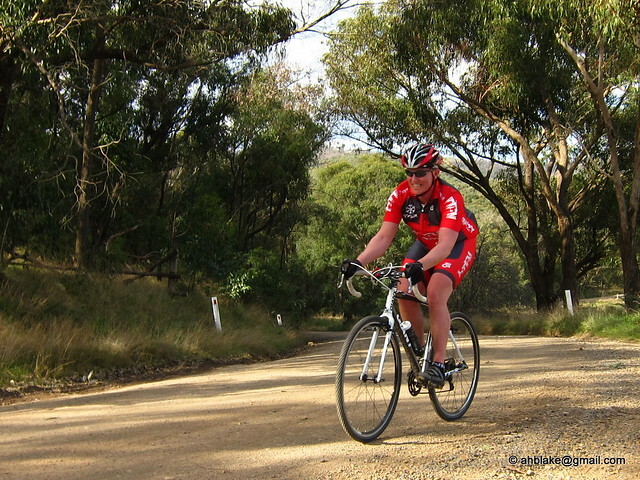 Totally hilly, I was chuffed to limp in to Hurstbridge near sunset, feeling utterly ruined. I did manage to snap a few faux-polaroid iphone shots of the scenerery, though.